“Drygulch Town” was originally released in 1963 by Ace as a double with “Prairie Raiders”. 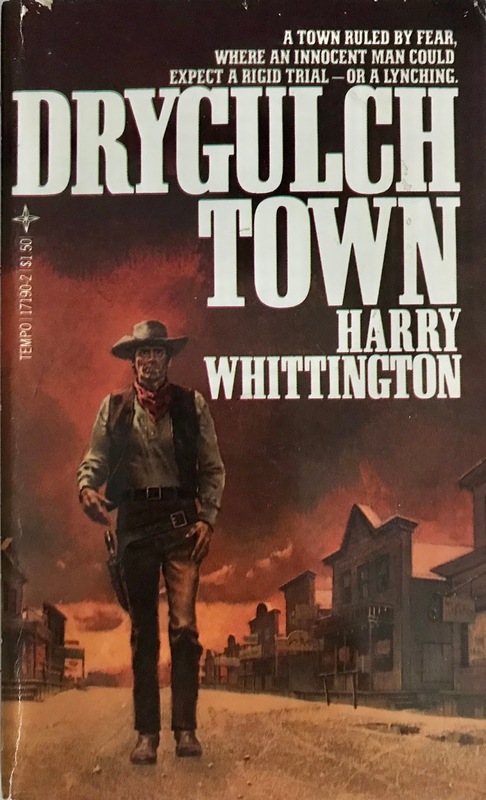 Both were written by the king of paperbacks, Harry Whittington. It was later re-released by Ace in 1972 with alternate artwork. In 1980, Tempo Books reprinted the novel again with alternative cover art. Does the book warrant three printings? Sadly, no. The novel begins with an exciting intro as attorney Steve Garrison rides into the small town of Carmack. He's warned to steer clear of the town with a few cautionary rifle shots. Garrison, determined to accept his position as defense attorney, ignores the shots and goes in the local bar to share his story with a local named Hawgans. Garrison is a lawyer from Cheyenne who's been hired to defend Kiner, a young man accused of killing Bryce Carmack's son Junior. It's a tough position to defend considering Bryce owns the town and all of the oil leases. In fact, Bryce had already taken it upon himself to lead a lynch mob to hang Kiner but it was disrupted by sheriff Waggner. The murder occurred after Kiner won a legit game of poker and left with the winnings. He claims Junior and another man attacked him in an alley and Kiner's fatal shot was in self-defense. The town, fearing backlash from Bryce, is in favor of hanging Kiner regardless of any evidence. 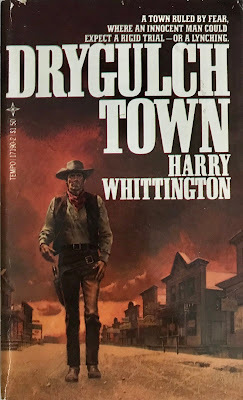 Whittington has a great opportunity here to leverage “Drygulch Town” into a stirring mystery regarding this unknown second assailant. I was envisioning a captivating narrative that explored Garrison's probing as an attorney/detective while receiving the obligatory death threats and attempts on his life. That would have been interesting and altogether a much more satisfying direction to take. Instead, Whittington waters this down with a recycled chain of events that finds the town just beating up Garrison, leaving him for dead, and then Garrison rehabilitating only to have it recycle two more times. There's very little investigation or defense here. Sheriff Waggner is the complacent white hat that serves no real purpose other than nursing wounds. Frustrating. Overall, it's a short read that isn't cumbersome or painful to get through. It's an okay western that had a lot more potential. If you love Whittington then this may be something you feel obligated to read. If it is just a great western you are reaching for...just go right or left on the shelf but leave this alone.